To learn more about events and read research from the Skills for a Changing World project, please find the full series here and sign up for regular email updates here. 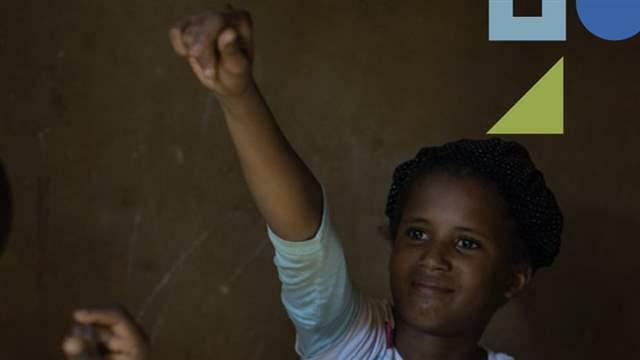 How can we best prepare children for success in their lives and livelihoods? From hunter-gatherer societies to early civilizations, and into modernity, generations have grappled with this key question. As they do, our definition of what counts as a high quality education has evolved, as have the sites used to prepare children for their future. whereby youth learned trades and skills for work. Throughout history families, employers, and communities have asked what skills and competencies children need to fit into the larger society and how to best cultivate those very skills. Our current world and the changes coming in the future require education to prepare children for a world of rapid change in technology, increasing interconnectedness, and new forms employment. No longer is the focus on mastering content knowledge sufficient in the age of Google. Thriving in today’s fast changing world requires breadth of skills rooted in academic competencies such as literacy, numeracy and science, but also including such things as teamwork, critical thinking, communication, persistence, and creativity. These skills are in fact interconnected. As young people are better able to manage their emotions, for example, their ability to focus helps them learn to read and by working on science projects together they learn how to collaboratively solve problems. This interplay of skills is central to both the concept of breadth of skills as well as to the educational strategies needed to help young people cultivate them. Ultimately, young people today must be agile learners, able to adapt and learn new things quickly in a new fast-changing environment. In short, the world is constantly changing. It always will be. But recognizing the nature of these changes is key to examining the current context in which we live, and the major changes to be expected in our future that should inform how we think of education today. Within this context, a key concept is respect for the breadth of skills. Many stakeholders have articulated the need for the breadth of skills approach. It is now central that we explore how to align those aspirations with delivery of education. Throughout time, education has been the way human beings pass down knowledge, values, and culture to subsequent generations. Yet, contextual factors define what kind of change each era faces, and what tools are needed to best deal with that change. Currently, there are changes in at least three notable domains with major implications for education: technology, work, and globalization. Within each of these domains there is promise for a better future where the world is more connected, efficient and equal. However each also has a flip side, perils that can come with rapid change leave large communities behind and fail to maximize every member of society’s potential. Today and in the future, we will need young people who are prepared to harness these promises and mitigate these challenges. Technology from the wheel to the printing press to the mobile phone has shaped human history and will undoubtedly continue to do so. Today, computers and the digital revolution are spreading across the globe, creating connections we have never before imagined and possibilities and perils only before dreamed of in science fiction. Whether it is called the second machine age, the Digital Revolution, or the 4th Industrial Revolution, technologists, economists and academics are all concerned with recent rapid technological advances and what they imply for the future. While artificial intelligence, exponential increases in computing power, and expanding mobile networks hold promise to make our lives easier and safer, they also threaten to leave those at the bottom even farther behind if not evenly distributed. It is not just that technology can do what we previously needed humans for but also that machines are increasingly working together without human interaction at all. The Internet of Things (IoT) does this by connecting objects, appliances and devices online: A car can automatically navigate to your next calendar appointment; an alarm clock can alert a coffee maker; and your refrigerator can order more milk when you run out. While these may seem like mundane examples, the potential to transform our world is tremendous. IoT enables our devices and objects to become active participants in our environment “capable of recognizing events and changes in their surroundings and are acting and reacting autonomously largely without human intervention in an appropriate way.” Six years ago the number of connected “things” surpassed the number of people in the world, and it is estimated by 2020 50 billion devices and objects will be on IoT. Many of these technological advancements have followed and even outpaced Moore’s Law, the observation in 1965 by the co-founder of Intel Gordon Moore that computing power will double every two years. Since its original conception, the law has been found to be applicable to more technologies than the original estimation for transistors, including supercomputer efficiency and internet speeds. It has also been applicable much longer than initial predictions, and instead is expected to describe advancements well into the future. In the words of Brynjolfsson and McAfee, this is central for how digital technology will progress and shape our world in a different way than previous innovations: “While transistors and the other elements of computing are constrained by the laws of physics just like cars, airplanes, and swimmers, the constraints in the digital world are much looser.” They further describe that digitization—the process turning information and media like text, video, photos and sound into the code that is understood by computers—is moving much faster than Moore’s Law would even predict. This combined with the exponential increases in computing power place us at an inflection point in history where technology promises to bring momentous change to our world. The increased connectivity has changed the pace at which knowledge and information are dispersed, opening up access to people around the globe of all socioeconomic levels. Google’s partnership with libraries around the world, for example, has digitized and made available online 20 million books previously confined to the walls of elite institutions. A movement for open educational resources has taken shape so course materials can be shared broadly at no cost, revolutionizing distance education and even heralded as a “social transformer.” These developments are especially promising for those who traditionally have not been able to access quality higher education. For example, recent research has shown a large share of Massive Open Online Courses’ user base in developing countries are from low- and middle-income groups, and have a higher percentage of female users than elsewhere. The promises of these new technologies are enormous, for example diagnosing diseases and prescribing treatment without human error or deploying systemically programmed devices that can make our cities “smarter” and safer. Yet there are potential downsides as well. Privacy and data security issues are deeply debated, as are questions of automation and job loss. The way we work is being redefined for future generations.Harvard economists have shown that automation has “hollowed out” the U.S. labor market over the last 50 years. 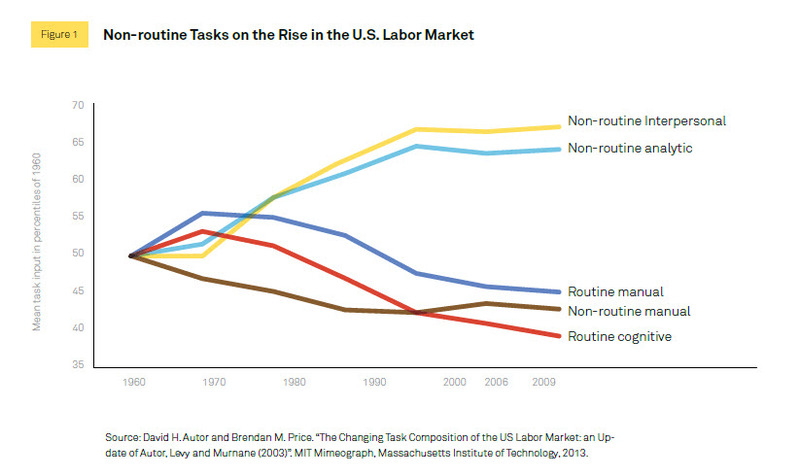 As Figure 1 shows, jobs that require mostly routine tasks are decreasing, including routine “cognitive” skills like accounting as well as routine manual skills like those on an assembly line. This means that many of the jobs that arose in the 20th century have been increasingly automated since 1960. Jobs requiring analytical and interpersonal skills, or “non-routine” skills, are on the rise and taking a larger share of the labor market. This is not a phenomenon unique to the U.S. economy. Research from the World Bank has demonstrated similar findings using data for 30 other countries, both low- and high-income, showing jobs requiring non-routine skills are globally on the rise. Interestingly, the cross-country comparison shows that in many middle-income countries routine cognitive skills are still of high importance, in contrast to trends in high-income countries where these have been automated. However, this may be only a matter of time as countries continue to increase their income levels, while analytical and interpersonal skills will likely become more important. For most countries manual skills are decreasing or staying stable and are expected to become less and less important over time.